Taking your computer on the road is a great idea as long as it’s portable. But even the lightest and smallest laptops add bulk to your travel bags. One solution to this conundrum is to invest in a handheld PC. Since the personal digital assistants became a reality they have evolved. Sadly this evolution has been at a much slower pace than that of other PC equipment so it’s only now that they are beginning to realistically become a replacement for the laptop computer. Even better than this though many are married to phones and kill two birds with one stone. The most important thing to look for when choosing a handheld PC is that it does everything you want it to. If you need email connectivity make sure that there’s an email client included. It can be surprising what manufacturers leave out in order to cram in features you might not need but look good on paper. Check to see what kind of input the device takes as some will have a small keyboard while others will rely on a stylus and you learning the special faux hand-writing that’s needed to input data into them. If theirs is a keyboard have a go with it to see if your fingers are small enough. As larger digits make typing a tricky art form that make missed keys commonplace. If you’re going to be spending a lot of time on text based applications it may be worth checking to see if the device is compatible with a portable keyboard. Although this adds bulk it will make typing much easier and more accurate. One aspect you need to look into is battery life. It’s no use having the latest gadget if the battery only gets you half an hour of use. Manufacturers generally overstate the battery life on these devices and it’s a good rule of thumb to take about a third of the quoted battery life for a more accurate figure. 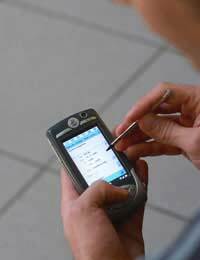 The screens can also be a real selling point on hand held devices but don’t be swayed by size alone. The brightness of the LCD screen is a much more important factor when it comes to using the device. If you intend to operate the hand held outside a brighter screen will be much easier to see than one that’s not even if it’s larger. Memory can also be an issue with hand held computers. The size of these devices means that the internal storage can’t always be as capacious as you’d like. Look for one whose internal memory can be boosted with memory cards or one that comes with a lot of storage space. Otherwise most of the devices on the market today will fulfill most of your needs. Many include web browsers and email capabilities not to mention phones so there’s plenty of scope out there for even the most demanding of user. If you just want a simple diary and address book though there are more than enough models to suit a smaller budget.